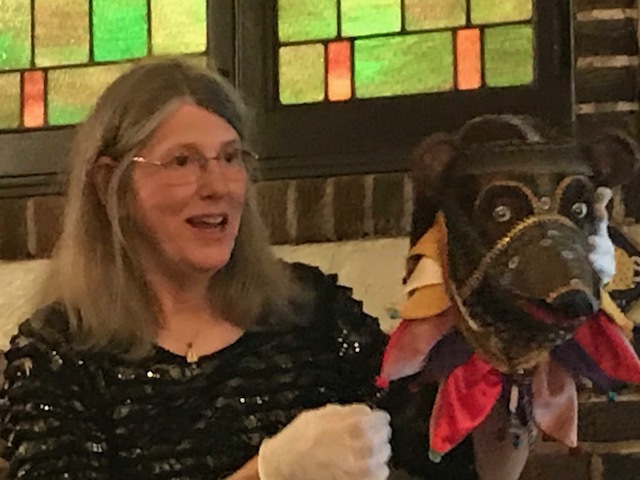 Carla Hanson, curator of a traveling exhibit called “Spirit of the Mask,” shared her collection of masks and their stories. 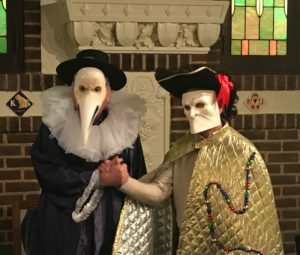 Masks can cover the face, head, and even the entire body, as demonstrated below by Rotarians Bob Swan and Jim Peters as they tried on masks and garments associated with the plague in medieval Europe. Created using all types of materials, masks play a role in dance forms, storytelling, ritual, and celebration. Hanson’s collection includes masks from more than 45 countries and cultures of the world. She brought examples from Native American tribes, Peru, Nigerian, Guatemala, Tibet, Bali, Russia, and more. Many were renderings of animals, reptiles, or the faces of spirits. In addition, there were Santa Claus costumes and Halloween masks familiar in the United State and a mask of a “nisse,” a white-bearded creature from Nordic folklore. 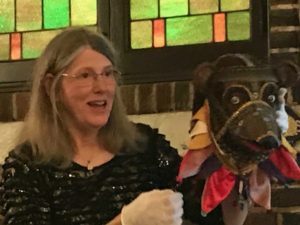 Hanson will be teaching a course about masks for Osher Lifelong Learning Institute in Olathe and in Kansas City this spring .